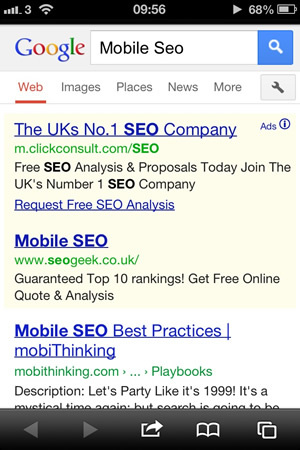 After a recent visit to a mini conference in Manchester on “SoLoMo” or Social, Location, Mobile I came back inspired about how to SEO for the mobile age in 2013. With the increase of device based marketing and mobile developments of the internet the way we are communicating is changing, and so is the way we SEO. With statements flying around such as “mobile consumption is taking over TV” and “Location based marketing is 2.5X more effective than traditional mobile advertising” it is no wonder the industry is buzzing with creativity over mobile and how to use it for our clients. You use it whilst you’re on the train to check the news, or respond to an e-mail whilst on the move. If you’re researching something, you know exactly what you are looking for. If you buy something then generally you have researched it somewhere else first. You might play games on it or listen to music but how often do you actually interact with the advertising on your mobile device. These are all general examples and obviously don’t represent every person but you get the gist. As a result your mobile offering needs to be clean, to the point and grab the attention of your consumer straight away. If you had 10 seconds before to make an impression, then mobile has just reduced that to about 2. What are the different ways of launching a mobile site? A Google favourite, responsive design means no duplicate content, no 301 redirects specific to mobile and no separate website. A responsive design is a site that uses the same content from the main website but changes depending on the device being accessed by. This is where all websites will eventually be developed as it is the most logical of the three options. Usually sitting on an “m.” subdomain, this is currently the most common way of adapting a site to mobile. It’s easy because it doesn’t affect any of the other aspects of the site and with Googles policy lets you point mobile specific crawlers at the site. The downside is that it gives you another site to manage, that means twice as many links, twice as many changes and twice as many problems. It’s the same as having a sub-domain and brings all the challenges, benefits and negatives as a sub-domain brings. The thought of having an actual “App-Store” App sounds appealing to a lot of retailers, however unless your client has the brand credentials and originality to back this up, then it is almost a waste of time. Getting people to interact with an App is difficult. Getting people to store it on their phone and use it regularly is damn near impossible. This is a luxury option and one that only the rich can afford, the rest of us should stick to responsive or m. subdomains, because we are likely to be richer in the short and long term as a result. What is the SEO best Practice? Googles policy on Mobile SEO can be found here. In December 2011 Google released a new mobile specific user agent, meaning that anything specifically made for mobile could be crawled as a separate entity, without it massively affecting your current site with duplicate content issues etc, as long as the “Google Bots” can recognise it as mobile specific content. Check that the site can be crawled in mobile – If your site can’t be found on Google within a mobile web browser using “site:http://www.example.com” then the likely hood is it isn’t accepting mobile bots. Add the “SetEnvIf User-Agent “Googlebot-Mobile” allow_ua” – within the “Blocked URLs” section in web master Tools. Create a Mobile Specific Site Map – this mobile specific version helps point the bots towards, which pages are your mobile site and which are your desktop versions. At the moment, standard practice remains, however with Google location products becoming stronger in the field, in 2013, this particular area will be more prominent than ever. Location marketing gives users the chance to search locally for the services they are looking for and Google is putting a lot of resources behind it! The trick here is to make sure that all your clients shops, sites, offices have a strong local presence, in local and national directories, with relevant and up-to-date addresses and phone numbers featured throughout the site and within the directories. We have been putting it off for ages, but 2013 is Google +’s year. The location pages are getting stronger influence over the natural searches and will end up crucial to everyday search experience, making the tracking of individual keyword rankings of less importance (eventually, probably not for a few years yet!). The one thing local, social stuff does give you is a bigger chance to own a bit of Web space. First movers on this will get a great boost against their competitors, so don’t wait to get left behind start building a strategy now! Sam Raife is a Leeds, Yorkshire, based Search Marketing Exec by day and an obsessed technology and superhero fan/author at night. You can find his wise pearls of wisdom on the latest technology, gadgets and superhero memorabilia at Battletoys.co.uk or follow him @battletoys on Twitter.